PHANTEKS warrants its products to be free from defects in material and workmanship during the warranty period; when given normal, proper and intended usage. If a product proves to be defective in material or workmanship during the warranty period, PHANTEKS will, at its sole option, repair or replace the product with same product or similar product. The replacement product assumes the remaining warranty of the original product or 30 days, whichever provides longer coverage for the customer. Step One: Contact Phanteks USA customer service at (909)598-2115 or email us at support@phanteksusa.com to obtain a Return Material Authorization Number (RMA#). Returned merchandise without RMA# will be returned to sender. Step Two: Phanteks USA will ship a new replacement product, along with a return shipping label and authorization information. Step Three: When you receive your replacement product, simply pack up the defective product and return it to Phanteks USA using the return label, box and any additional information provided. A: PHANTEKS CPU Cooler products are warranted for five (5) years for parts and labor. B. PHANTEKS Fan products are warranted for five (5) years for parts and labor. The warranty is non-transferable. Only the original customer is covered under the warranty. It is important to note that our warranty is not an unconditional guarantee for the duration of the warranty. Should the product, in PHANTEKS' opinion, malfunction within the warranty period, PHANTEKS will at its discretion repair or replace the product that is equal or greater in value depending on supply. Any replaced parts become the property of PHANTEKS. The warranty does not apply to the software component of a product or a product which has been damaged due to accident, misuse, abuse, improper installation, usage not in accordance with product specifications and instructions, natural or personal disaster, or unauthorized alterations, repairs or modifications. • Any unsuitable environment or use of the product in PHANTEKS' opinion. • Any product which has been modified without official permission from PHANTEKS, or on which the serial number or warranty sticker has been defaced, modified, or removed. • Damage, deterioration or malfunction resulting from: Accident, abuse, misuse, neglect, fire, water, lightning, or other acts of nature, commercial or industrial use, unauthorized product modification or failure to follow instructions included with the product. • Third party products using PHANTEKS components will not be covered by warranty. Contact vendor or the manufacturer for information about servicing. • PHANTEKS does not cover warranty for display samples and opened box items. • Unauthorized repairs to a PHANTEKS product will void the warranty offered by the warranty. PHANTEKS reserves the right to refuse to service any product which has been altered, modified or repaired by non- PHANTEKS service personnel. 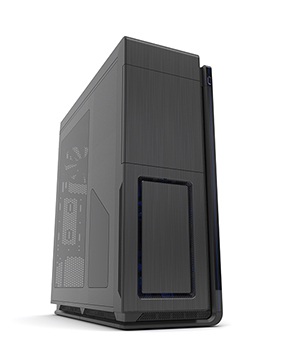 •PHANTEKS does not warrant that this product will meet customer's requirements. It is customer's responsibility to determine the suitability of this product. • PHANTEKS reserves the right to replace the product with a service product at their sole discretion at any time. In the unlikely event that warranty service is required, PHANTEKS will request a proof of purchase (store receipt or invoice) and the user must provide that in order to receive warranty service unless permitted otherwise. PHANTEKS’ sole obligation and liability under this warranty is limited to the repair or replacement of a defective product at our option. PHANTEKS shall not, in any event, be liable to the purchaser or any third party for any incidental or consequential damage, (including, but not limited to, damages resulting from interruption of service, lost of data and loss of business), or liability in tort relating to this product or resulting from its use or possession. On rare occasions, a newly purchased PHANTEKS product may be delivered in non-working order. We are working to avoid these issues, but unfortunately, these situations may arise from time to time. Within the 15 calendar days of purchase, should you experience an issue with your new PHANTEKS product, we ask you to return the product to the place where it was originally bought. You will be required to give a proof of purchase. In the event that warranty repair or replacement is necessary, PHANTEKS will request and you must provide proof of purchase (store receipt or invoice) in order to receive warranty service. In North America: Within the first 30 days of purchase, please return your product to your dealer or reseller for a replacement. If the product is still within warranty and you can no longer return it to your dealer, please contact PHANTEKS Customer Support for assistance and instructions. PHANTEKS will not accept returns without prior approval and an RMA number. In Europe: Within the first year after purchase, please return your product to your dealer or reseller for a replacement. If the product is still within warranty and you can no longer return it to your dealer, please contact PHANTEKS Customer Support (see above) for assistance and instructions. PHANTEKS will not accept returns without prior approval. Based on company policy, customers are responsible for shipping costs to ship back the defective item for RMA repair/replace. Once the item is repaired/replaced, PHANTEKS will ship the item back to the customer. Shipping methods will be at PHANTEKS’ discretion. PHANTEKS will not be able to ship repaired/replaced items in the same method as the customer's because not only would this not be efficient, but it may delay the return of the repaired/replaced item. Therefore, PHANTEKS reserves the rights to ship according to what it deems the most efficient standard method of shipping.